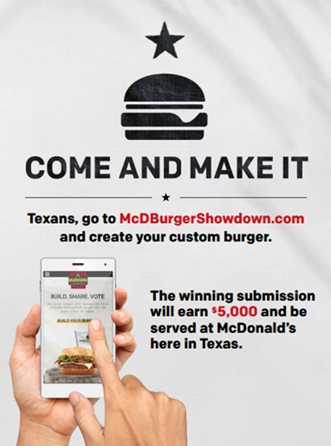 Now through March 27, customers may visit www.mcdburgershowdown.com to create their own personalized burger for a chance to win $5,000! McDonald's surveyed Texans across the state to hear what they’d like to taste on their “Texas” burger to help them come up with the tastiest ingredients. Guests may choose from current McDonald’s items and some new, unique additions. North Texans may select up to 10 toppings, condiments and flavors, name their burger and share it on social media. Voting will take place April 2 – 15. The winning burger will be announced in June 2016 and will then be available at all participating McDonald’s restaurants throughout the state of Texas. Ba da da da da. I'm loving it.